The Monthly Home visit is a way through which the Holy Family of Nazareth has entered thousands of Christian homes throughout the ages. This visit is a challenge to families. 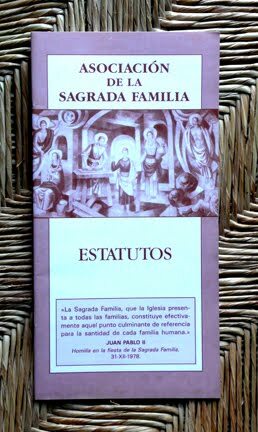 It consists of a grouping of families who welcome to their homes a little shine (Capillita of the Holy Family). This Holy Family Capillita, when enthroned in the home, occupies a visible place where the members of the family gather to pray special devotions to Jesus, Mary and Joseph, for their own and other families. This devotion encourages the practice of the virtues of the Holy Family—Jesus, Mary and Joseph. Those members of the family who gather around the Capillita are led to a deepening appreciation of the mysteries that are made known in Nazareth in regard to Christian marriage and the family. The purpose of the Monthly Home Visit is to transform each Christian family into a "holy family and each home into a new Nazareth." This is accomplished by having each family receive the Holy Family Statue. The Holy Family Pilgrim Statue travels from one home to another through the arrangement of different groups or Coros of families. The origin of the Monthly Home Visit is obscure. At the turn of the 19th century, it was lost amongst other devotions, but has been rediscovered and embraced by the religious Congregation of the Sons of the Holy Family, which was founded by St. Joseph Manyanet in 1864. 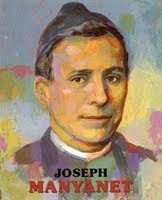 On June 7, 1910, Saint Pius X extended his apostolic blessing to all the families involved with the Monthly Home Visit. The Holy Father praised the efforts of the religious Sons of the Holy Family to promote and spread the devotion and imitation of the Holy Family. He appointed these religious as the permanent directors and custodians of this particular form of devotion to the Holy Family of Nazareth. The Monthly Home Visit grew very rapidly, extending throughout Spain, Italy, Portugal, France, Holland and Belgium. In 1920, the first missionary Sons of the Holy Family brought it with them to the United States and then to Argentina, Mexico Colombia, Venezuela and Brazil. Each classroom (grade) will form a Coro at Holy Cross Catholic School. The teachers of each grade will be the Celadora (leader), who is responsible for the functioning of the group and will schedule the Monthly Home Visit for each student in her class. Beginning the First Week of Advent, the new Church Year, the Capillitas will go home with our students, according to the Monthly Home Visit Schedule set up by the teachers (Celadoras).